What is this Volo City DC thing all about? Volo City DC operates a lot like the sports leagues of your youth. We bring friends and groups together to compete in a wide range of sports and activities. Most of our leagues are 6 to 8 weeks long with a final championship tournament and end of season parties. We also host one-day events and tournaments as well. From soccer, to skeeball, to karaoke, Volo City DC organizes the events so all you have to do is show up and have fun! Why should I join Volo City DC? Volo City DC understands for most people joining a sports team is about hanging out with your friends or meeting new people and having a fun time! Other leagues are good at organizing the sports but don’t have much of a social aspect to them. Other leagues are good at making it social but don’t they don’t do a good job with organizing the sports. Volo City DC is all about getting BOTH right! We strive to keep the games fair and stress free so you all you need to do is show up, play, socialize and have a GREAT time! How much does it cost to join Volo City DC? Registration dues vary by sport and location. Volo City DC strives to keep dues low while still providing a quality experience for our members. Most leagues range in cost from $40 to $90 for our most expensive and best located private fields. If you registered accidentally as a free agent, send us an email at info@volocitydc.com and we can place you on your friends’ team. Absolutely! Nearly all of our sports allow for individuals or free agents to register and get placed on a team! If you’re new to Washington, DC, Volo City is a great way to meet a ton of fun people quickly! 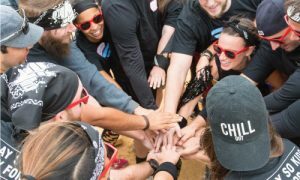 Lots of people join Volo City DC for different reasons and sometimes you may find yourself on a team that you just don’t mesh with. No worries, shoot your league commissioner an email and we will try and find you a new home! Volo City DC will provide a full refund any time up until two weeks prior to the final season registration date. If a request for refund is received within 2 weeks of the season registration ending, a player may receive a credit towards future Volo City DC activities. After the end of registration, Volo City DC will not be able to offer any refunds or credits. To register select your league and desired sport. Click through the links and you will be guided through the process. If you have any questions email us at info@volocitydc.com!